In February 2010 I took a ride on my Brompton (a vital photo-accessory for the urban landscape photographer) along the short length of the ridiculously named ‘Fatwalk’ beside Bow Creek. It was a dull rather turgid day, and probably I would have put off my trip to a later date but I’d been asked to go and record an interview with a student film crew at the View Tube overlooking the Olympic site a mile or two away that afternoon, so it seemed a good idea to do this on the way. Apart from the silly name, the stretch of footpath, although it has some interesting views – which you can see at Bow and The Fatwalk (looking rather gloomier than the image below, processed in Lightroom 4 for this post) but is ultimately frustrating, coming to an end at the fence in the picture. The fenced area is Cody Dock (aka Gasworks Dock) and the end is more frustrating as past the pipe bridge at the right of the image is another section of the path, only accessible from a private industrial estate. A couple of weeks ago, I was able to visit Cody Dock, going inside rather than simply peering through the fence. In 2010 the ground inside was more or less covered with piled up containers and other material, in parts around 10 ft high, and it was a surprise to see that now virtually the whole area was cleared. Work is going ahead on an ambitious project to turn the long-disused dock into a community resource with moorings, visitor centre & café, an exhibition space, an industrial heritage archive and museum, affordable studio and workshop space and dry dock facilities and a lively programme of activities. Already a Docklands Community Boat is in operation. The Gasworks Dock Partnership needs funding and volunteers to complete the project, which intends to open to the public this summer, and you can find out more about it and contribute to it on Spacehive. They need to raise £140,276 by 6 June. 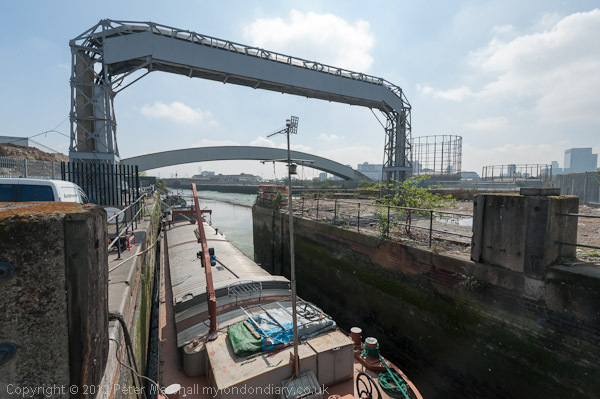 There is more information on Cody Dock and the project – as well as many more images – on My London Diary in Gasworks Dock Revived. I spent around an hour on the site, talking with Simon Myers who noticed the site from his boat as he went up Bow Creek and decided to find out more, eventually setting up the Gasworks Dock Partnership as a social enterprise and then as a charity to redevelop the site where others had told him this was impossible, and taking pictures, then asked Simon to let me out onto the riverside path so I could walk along by the river to Stratford where I needed to check the paths for my forthcoming workshop. One of the benefits of opening up the dock is that it will open up a further length of the riverside path – and they need funding for a wooden swing bridge across the dock entrance when the current fixed barrier is removed to give access to the dock. It should then be straightforward to extend the end of the existing inaccessible section of path to join with an existing path to take walkers to the Bow Creek Nature reserve and also along to the Thames at East India Dock and the Trinity Buoy Wharf arts area. Whether the riverside walkway by Canning Town station, completed in the 1990s, will ever be opened to the public remains unclear. This entry was posted on Thursday, April 26th, 2012 at 10:50 am and is filed under My Own Work. You can follow any responses to this entry through the RSS 2.0 feed. You can leave a response, or trackback from your own site.